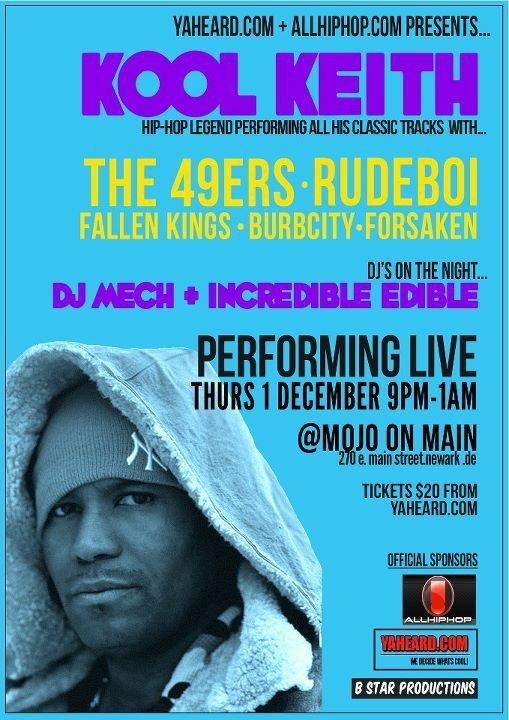 The 49ers will be peforming at Mojo on Main (Newark, De) with the legendary Kool Keith on Thursday, December 1, 2011. This will be Kool Keith’s first time performing in The 49ers’ home state of Delaware. Tickets are on sale now and can be purchased at the door. The damage is $20.00 and you must be 18 years of age or older. Also performing that night is Rude Boi, Fallen Kings, Burb City, and Forsaken. If you’re in the tristate area, make sure you come check us out. It’s going to be a night to remember, believe that! ~ by The 49ers on November 28, 2011. Incredible show! Thank you Kool Keith for coming to Delaware. Thank you Marchitect & Jas Mace for putting this together. Shouts to all the local acts too. Kool Keith acapella, The 49ers K.M.A., DJ Slice body tricks, everything was dope!